The 1992 papal exhortation, Pastores Dabo Vobis , (meaning “I shall give you shepherds”) can be found on the Vatican web site. The evidence suggests that at least the following sections might have been overlooked during the selection of pastors for the parish of St Vincent’s Redfern. … priests should therefore cultivate a series of human qualities, not only out of proper and due growth and realization of self, but also with a view to the ministry. These qualities are needed for them to be balanced people, strong and free, capable of bearing the weight of pastoral responsibilities. They need to be educated to love the truth, to be loyal, to respect every person, to have a sense of justice, to be true to their word, to be genuinely compassionate, to be men of integrity and, especially, to be balanced in judgment and behaviour. A simple and demanding program for this human formation can be found in the words of the apostle Paul to the Philippians: “Whatever is true, whatever is honourable, whatever is just, whatever is pure, whatever is lovely, whatever is gracious, if there is any excellence, if there is anything worthy of praise, think about these things” (Phil. 4:8). It is interesting to note that Paul, precisely in these profoundly human qualities, presents himself as a model to his faithful, for he goes on to say: “What you have learned and received and heard and seen in me, do” (Phil. 4:9). Of special importance is the capacity to relate to others. This is truly fundamental for a person who is called to be responsible for a community and to be a “man of communion.” This demands that the priest not be arrogant, or quarrelsome, but affable, hospitable, sincere in his words and heart, prudent and discreet, generous and ready to serve, capable of opening himself to clear and brotherly relationships and of encouraging the same in others, and quick to understand, forgive and console (cf. 1 Tm. 3:1-5; Ti. 1:7-9). ….. Today this is one of the most eloquent signs and one of the most effective ways of transmitting the Gospel message. The People of God should be able to say about the priest, who has increasingly matured in human sensitivity, something similar to what we read about Jesus in the letter to the Hebrews: “For we have not a high priest who is unable to sympathize with our weaknesses, but one who in every respect has been tempted as we are, yet without sinning” (Heb. 4:15). Warning – these individuals are Neocats! Easter at St Vincent’s was once something greatly anticipated by the community – a time of reflection, thanksgiving, renewal and celebration. People would come from far and wide to be part of it. Why then was yesterday’s (Holy Thursday) ceremony attended by barely two dozen members of the community? Since their arrival in 2004 the Neocat clergy have fought to strip away the traditions of this parish and unilaterally impose their own alien ways of doing things. Try using this site’s search facility for "easter" and you’ll quickly get a picture of what’s been happening over the years. Three more letters – from Bishops Saunders, Sproxton and Wilson – have been added to Not a catholic. It seems that the Neocats, not content with their constant attempts to destroy the St Vincent’s community, are now diverting some of their energies to the destruction of the church (building) and its furnishings. Several weeks ago the church foyer was given a makeover – rough patches to damaged plaster, sloppily applied paint (traces of which may still be found on Ted’s portrait), and a brand new notice board (lockable, no doubt to protect the offensive notices so dear to the Neocat heart). Ralph has recently returned to St Vincent’s after an absence of many weeks following a particularly unpleasant encounter with the Neocat clergy in which Clesio Mendes told him in no uncertain terms that he was not a Catholic, and that he was allowing himself to be led astray by the community. This was not the first time that a member of the community has been attacked in this manner. 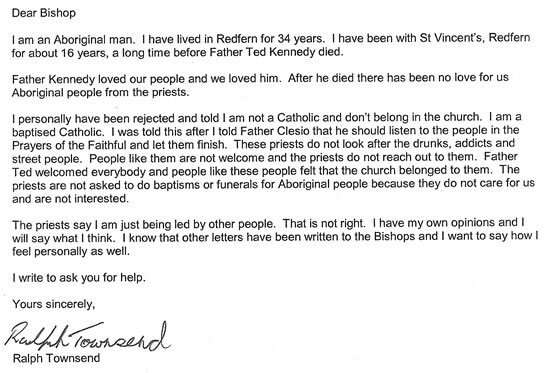 For years now, many at St Vincent’s have been unable to take communion from the Neocat clergy who despise the community so, and have elected to share only in the Blood of Christ from the solitary non-Neocat Eucharistic minister. This seems to have recently come to the attention to the ever alert Clesio Mendes, who queried communicants a week or two ago as to why they weren’t queuing up for the Eucharist from the Neocats. Well folks, in the absence of any notification to the contrary – or any notification at all, despite numerous attempts to contact the presbytery about the matter over the last week – the customary Sunday Mass was celebrated at St Vincent’s today. 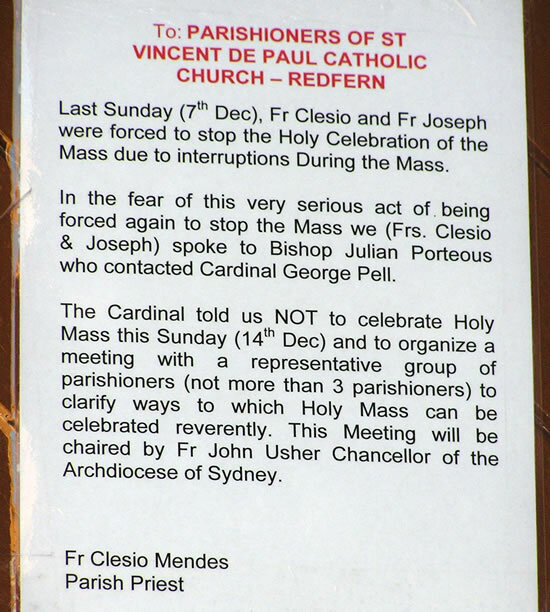 Clesio Mendes, and, it would appear, Cardinal George Pell and Bishop Julian Porteous, have unilaterally found the St Vincent’s community guilty of interrupting the Mass. In fact, the Mass was interrupted by Pelle and Mendes, who tried to stifle the Prayers of the Faithful – see Denied Sunday Mass Again.